Volvo has underlined the class-leading safety position of its S40 models by winning yet another prestigious award. Now added to the roll of honour already achieved by the S40 is a coveted 1998 What Car? Safety Award. Says Editor, Mark Payton: "This award recognises a maker who brings exceptional dedication and expertise to the business of keeping you alive. The S40 is tangible proof of Volvo's superiority." This latest trophy complements safety awards won worldwide by the Volvo S40/V40 range including the Prince Michael Award for Road Safety. Features that have helped the car set new standards include Volvo's unique SIPS side impact protection system, side airbags, anti-lock brakes and seat belt pre-tensioner; on all models. The car also scored the only maximum four star rating in the recent Euro NCAP crash test programme and was awarded the highest safety score by the Consumer's Association in their recent Which? survey. But Safety chiefs at Volvo are not resting on their laurels. Says Stefan Nilsson at the Safety Centre: "We are already developing even more safety innovations for our new products, including an inflatable curtain to protect against head injuries in side impacts and a new seat aimed at achieving a significant reduction in whiplash injuries in low speed, rear-end collisions." The direct -injection Volvo is a four-cylinder 1.8-litre engine that was originally developed by Mitsubishi Motors Corporation and has been modified by Volvo for the S40/V40 models. The power output is 125 bhp and peak torque is 174 Nm. Deliveries of the engine will begin in March and the first cars are expected to be on the market in the spring of 1998. Volvo, the manufacturer of the UK’s best selling large estate cars - has added two new models, priced at under £20,000, to its versatile and popular V70 range. The new V70 Torslanda arrived in the UK with two engines - a 126 bhp 2.0 litre and a 144 bhp 2.5 litre - and is available in six colours. The highly specified interior boasts power steering, electric windows, RDS radio cassette with 6 speakers and electrically adjustable door mirrors. The V70's seats are supportive and ergonomically designed and feature the new exclusive Andorra upholstery. The Torslanda can also be tailored to individual requirements from a wide range of Volvo accessories. The V70 Torslanda features class leading safety including SIPS (side impact protection system), SIPS airbags, driver's airbag, front seat belt pre-tensioners, five three-point seat belts, five head restraints, ABS and a high level LED brake light for increased visibility. Volvo’s V70 has been voted "Estate Car of The Year" for three years in succession by the top selling motoring magazine Auto Express. 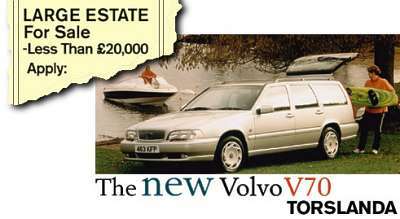 Judged by the magazine on the following criteria, accommodation, driveability, economy, refinement, safety and value for money, the Volvo V70 won against stiff competition including the BMW 5-series Touring and the Peugeot 406.